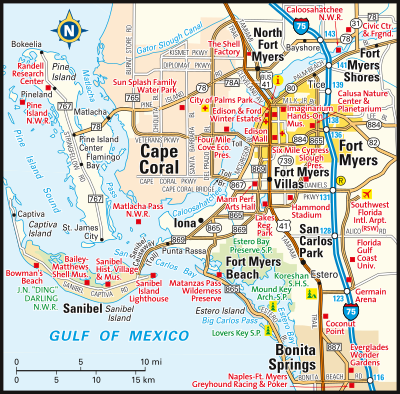 As the largest unincorporated area in Lee County, the community of North Fort Myers, Florida, is composed of approximately seventy square miles. North Fort Myers stretches from the northern shore of the beautiful Caloosahatchee River to Charlotte County and east to Alva, Florida. North Fort Myers is home to a diverse community of young professionals, retirees and everyone in between. The area is also home to many seasonal residents and is a great place to buy a vacation home, investment property or primary residence. Slowly, the North Fort Myers community is emerging from a relaxed, rural lifestyle to an expanding business community. This means, while it is a wonderful place to live now, the quality of life here will only get better! Residents of North Fort Myers enjoy an abundance of recreational opportunities including boating, fishing, golf, tennis and more. Previously known as New Prospect, Samville, Cabana City, Woodrow and Bayshore, the North Fort Myers community has a long rich history and a great deal of pride. This census-designated place in nestled in the Cape Coral-Fort Myers Metropolitan Area and affords its residents easy access to, not only great recreation opportunities, but also wonderful shopping and dining options. With all of its wonderful amenities, it is no wonder so many prospective homebuyers choose North Fort Myers as their new home. North Fort Myers is comprised of numerous charming neighborhoods and subdivisions including gated communities, retirement communities, mobile home parks and neighborhoods of single family homes and manufactured homes. Homes for sale in North Fort Myers come in a broad price range with prices dependent upon the property’s age, size, style and location. While there can be exceptions, typically condos and townhomes in North Fort Myers top out around $1.2 million and have an average listing price around $195,550. Mobile homes, the least expensive home option in North Fort Myers, have an average listing price around $50,000. North Fort Myers single family homes can have listing prices near $3 million, but the price range is so broad, the average listing price for a single family home in North Fort Myers is only $439,900. If you would like to learn more about the homes for sale in North Fort Myers, Florida, please do not hesitate to contact us today for assistance. Indian Creek Golf Villas Bldg.